I am beyond honoured and excited to be a guest designer at Miss Daisy Stamps today! When I received the stamp that I was to use I couldn't have been more excited! Butterflies have a very special meaning to me especially yellow butterflies. details. Allow me to introduce you to "Becca's Butterfly" from Miss Daisy Stamps. 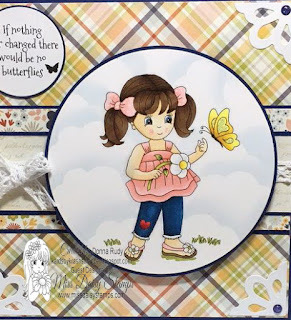 How adorable is she with her butterfly friend and so super cute outfit! After printing my stamp to the size I wanted I coloured it with alcohol markers and cut it out using a classic circle die. The sentiment (comes with this stamp when you purchase it) was printed and cut out. I added some Diamond Stickles to the butterfly wings - I like a little bit of bling on my cards . It is hard to see in the photo but I added some white polka dots to her hair bows and cheeks just for fun. A cloud die, some baby blue ink and a dauber helped me create my clouds. Some corner dies, sparky gumdrops (enamel dots), and some crochet lace ribbon finish off my card. White Gelly Roll Pen, Diamond Stickles, Baby Blue Memories ink, Corner die set - Whimsy Stamps, Crochet Lace Ribbon - stash, Forever In Time Pop Dots, Ice Ice Baby Sparkly gumdrops - YNS, Classic Circle die - Spellbinders, Fiskars circle cutter. An extra special thank you to Kathryn Elizabeth and Miss Daisy Stamps for the opportunity to be a Guest Designer today. Thank you so much for popping by today! Your thoughts and comments are always appreciated. Congrats on your Guest DT Spot! Your card is absolutely adorable and everything about it is just perfect!